Bright Spots These festive, two-sided Christmas cards feature a full photo on the front and an editable message on the back. The rose-gold foil spots can be changed to red or gold foil, and you can choose from over 80 colors for the solid colors. Floral Joy Bright red and green berries and holiday greens give these cards a traditional appeal, and your photo in the center circle completes the charming greeting. Upgrade to rounded corners or double thick paper if you really want to impress. 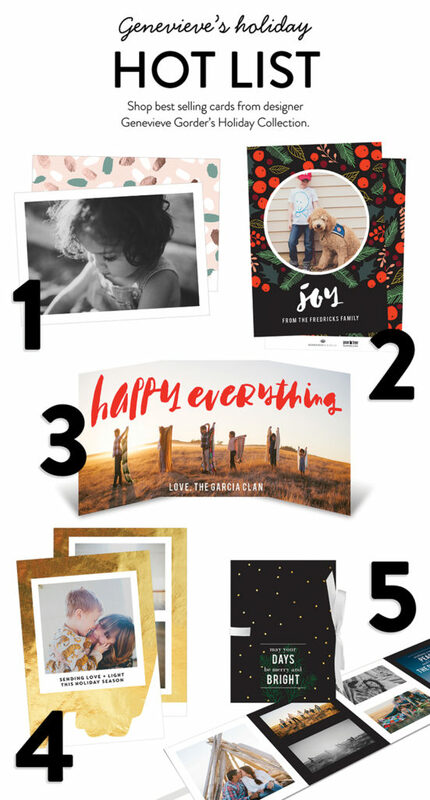 Holiday Resolutions Let everyone in on your New Year’s resolutions with these gorgeous holiday photo cards. The three-panel card features a spot for your resolutions, plus five photos, including one full-length photo on the inside. Foil Swash These luxury Christmas cards positively glow with real foil covering the front and back, and the double-thick paper adds to the luxurious feel. Choose your foil color from gold, rose gold or red. Merry & Bright Ribbon Booklet These luxury Christmas cards are folded up and tied with a ribbon, just like a gift. The message on the front wraps around to the back, sprinkled with gold stars. Bold, graphic frames surround your photos inside.